Today's Interior Design Toronto store spotlight focuses on Scavolini Toronto, one of Toronto's premier retailers of meticulously engineered Italian kitchens, bathrooms and lifestyle products such as closet systems, modular shelving, furniture and accessories, along with a full suite of design services. What brands does Scavolini represent? Scavolini Toronto is the only local distributor of Scavolini products. The Scavolini Toronto showroom is located in the Castlefield Design District at 1330 Castlefield Avenue. At 6,500 square feet, with 7 meticulously engineered model kitchens, the Scavolini showroom makes it easy to imagine your home with a brand new kitchen from Scavolini. Multiple sleek, ultra-chic kitchen models and systems that blend traditional touches and altogether unorthodox materials (think: leather cupboard doors with visible stitching, or linen- lined cabinets perfect for displaying glassware), all offered in customizable configurations. Modular closets, bookcases and bathroom vanities with porcelain tops and integrated sinks. Plus, art installations by Toronto gallery General Hardware and fresh pop up installations from local artists and designers. For many, the Scavolini brand is synonymous with Italian design and the company is considered a pioneering style icon. From Scavolini’s beginning in 1961 in a small workshop in Pesaro, Italy, Scavolini has since grown to reach major international design status. With over 50 years of history – a crescendo of initiatives reflecting the company’s ability to constantly adapt to ongoing changes in taste, lifestyle, the marketplace, and the advent of new technologies – Scavolini is a striking example of corporate growth, viewed as a benchmark model for the industry. Scavolini Toronto is the only local distributor of Scavolini products. Known for its clean lines and refined simplicity, Scavolini Toronto’s streamlined ensembles range from sleek, ultra-chic models to systems that blend traditional touches, such as panel-front doors. Combine glass in matte and glossy finishes or try altogether unorthodox materials like leather cupboard doors with visible stitching, or decorative open modules in yellow melamine, offered in various materials and configurations. Scavolini Toronto is a family owned and operated business, offering dedicated, personal service. Their team of in-house designers understand how to create kitchens and living spaces of style and elegance and their team of installers are trained and experienced in delivering the precision of fit and craftsmanship that define a Scavolini home. 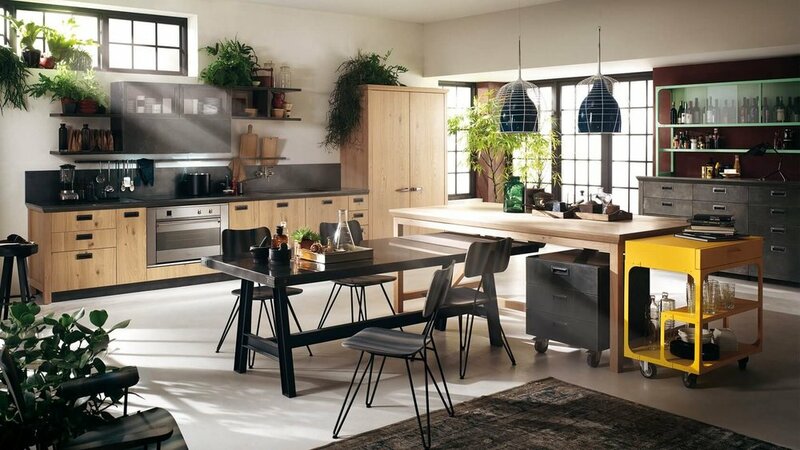 Designed by Diesel Living, Scavolini has introduced the Diesel Open Workshop line, a collection that introduces a warm yet distinctive industrial look to an intimate space within the home. This line is available in three distinct configurations, each with its unique combination of stone, metal and colours. A skillful combination of colours and textures combines within this charming yet modern Scavolini design, giving the bathroom unprecedented character. The cabinetry features a streamlined silhouette, thanks to doors with a recessed profile, perfect for storage. The wall-mounted base unit and dedicated line of accessories - which includes matching taps, shelves and towel rails - complete this bathroom collection, and are available in a choice of white, brass or aluminium finish. The Michelin-starred chef and the Italian kitchen manufacturer have co-branded a great-looking kitchen system called Mia by Carlo Cracco. The kitchen features multi-functional appliances and high-tech upgrades including a vacuum-packing machine, food dehydrator, and meal warming lamps. The sleek steel finish of the appliances complements the smooth clay and stone cabinets, providing a professional look without the sterile industrial feel.